Stunning views!!! Beautiful 2 story home backs up to rolling pastures and boasts breathtaking views of the Pismo Beach coast line and Oceano dunes. Spanish style complete with Satillo tile entry and serene water feature in the landscaped front yard. The first floor has high vaulted ceilings and 2 year new laminate wood flooring. 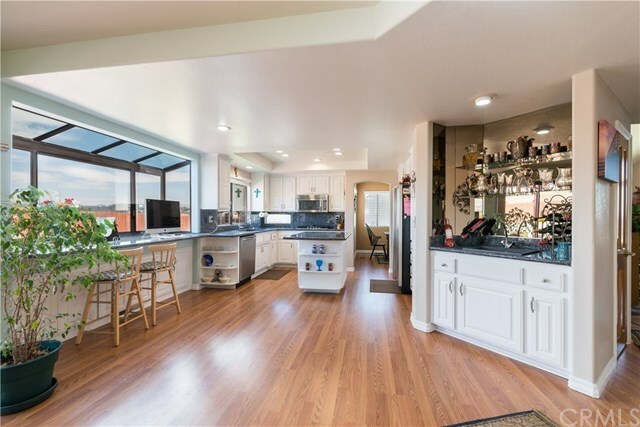 Gorgeous upgraded kitchen with granite counter tops, kitchen island and granite top sitting area with large garden window. Built in wet bar between the kitchen and family room. Family room, with fireplace, and living room are located on lower level along with one bedroom and full bathroom. Master Bedroom, Master Bathroom, 2nd full bathroom and two additional bedrooms located on the second story. Spacious Master Bathroom has a jacuzzi tub, wide shower with bench, double sinks and two additional closets. Bonus Room upstairs with built in wet bar, fireplace and balcony. Great spot to enjoy the fireworks on the 4th of July!